When forcing a value into the control using the Override Rule property it is important to understand that the result of the Override rule takes priority over what is actually displayed in the control. MyCheckBox is the name of the check box the override rule is being applied to. When using form control values in a rule the Return value of the control is used; i.e. 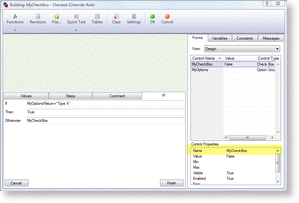 the control name is displayed as MyControlNameReturn in the rule. When using the override rule however, only the actual name of the control should be used; i.e. MyControlName. See the How to select the Control Name in the Rule Builder section below. The rule above will force the value of the check box to equal True (checked) when the selection in the control MyOptions equals Type A. The check box can be de-selected (unchecked) while the value in the control MyOptions equals Type A, but the value DriveWorks will always use is the result of the override rule. To prevent the control from displaying information that is contradictory to the result of the override rule please refer to the Considerations when using the Override Rule section below. Override rule must result in True or False. It must also conform to any form messages that could be displayed by the Error Result property. Override rule must result in an item that can be selected from the combo box. It must also conform to any form messages that could be displayed by the Error Result property. Override rule must result in an item that can be selected from the list box. It must also conform to any form messages that could be displayed by the Error Result property. Override rule must result in an item that can be selected from the option group. It must also conform to any form messages that could be displayed by the Error Result property. Override rule must result in a number that falls in between the minimum and maximum property values set for the control. It must also conform to any form messages that could be displayed by the Error Result property. Override rule must result in text or a number that conforms to any form messages that could be displayed by the Error Result property. Highlight the control from the forms tab of the Rule Builder. Double Click the Name property from the Control Properties section directly below the list of form controls. The Control Name will appear in the position of the cursor in the rule editor or, if a function wizard is open, in the position of the cursor in the function wizard. It is highly recommended that when using the override rule the Enabled property is set to False (disable). This will force the user into entering different information into the control that has invoked the override value. Now when the control MyOptions equals "Type A" the check box will be checked (TRUE), but it will also be disabled (FALSE), preventing the user from un-checking the check box.